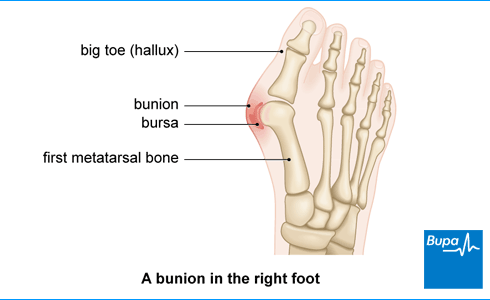 Bunion surgery is an operation to remove or realign the bone that sticks out on your big toe when you have a bunion. This will set your toe joint into a better position and relieve pain. The treatment and care you receive may differ from what’s described here as it will be designed to meet your individual needs. Your surgeon will explain how to prepare for your operation. For example, if you smoke, they might advise you to stop, as it increases your risk of getting a wound infection and will slow your recovery. Bunion surgery is usually done as a day-case operation. This means you have the operation and can go home the same day. It’s a good idea to prepare your home in advance for when you return from hospital. You might want to rearrange your furniture so you have more space to move around if you’re using crutches. Place items you use a lot where you can reach them easily. Stock up on frozen or tinned food too, so you don’t have to go shopping immediately after your procedure. You may need some extra help during the first few days at home so see if your family or friends can stay with you. You can have bunion surgery under general anaesthesia and be asleep during the operation, or you may have local anaesthesia. This will completely block the pain in your foot and you’ll stay awake during the operation. You can also have bunion surgery under spinal anaesthesia – this will numb the nerves from your waist to your toes. Your surgeon might give you a sedative with local and spinal anaesthetic to help you relax. A general anaesthetic can make you sick so it's important that you don't eat or drink anything for six hours before your operation. Follow your anaesthetist or surgeon's advice. If you have any questions, just ask. You might need to wear compression stockings during bunion surgery to keep your blood flowing well through your legs. Your surgeon will discuss with you what will happen before, during and after your procedure, and any pain you might have. If you’re unsure about anything, ask. No question is too small. Being fully informed will help you feel more at ease and will allow you to give your consent for bunion surgery to go ahead. You may be asked to do this by signing a consent form. While these may help to reduce pain, they won't stop your bunion from getting worse over time. But your GP, podiatrist or chiropodist may recommend that you try these first before you consider surgery. Your GP probably won’t be authorised to refer you for surgery until you’ve tried them all. What happens during bunion surgery? Surgery to remove a bunion usually takes less than an hour, but it will depend on the type of operation you have. Ask your surgeon how long your operation will take. There are lots of different types of operations to treat bunions. The exact procedure you have will depend on things like the size of your bunion, and the shape of your foot. If you have arthritis in the joint of your big toe, this may also influence which procedure you have. Usually, the operations will involve your surgeon removing some bone and re-aligning it to make the side of your foot look straighter. The exact shape of the cut will depend on your specific needs. Your surgeon might repair ligaments and tendons in your foot too. They may use screws or wires to keep everything in place. These are usually permanent, but sometimes your surgeon will remove them later. To access your bunion, your surgeon may first make a cut on the inner side of your foot, over your big toe joint. Or they might do keyhole surgery and get to the bone through several small cuts. An operation called metatarsal osteotomy is a common type of bunion surgery that involves cutting and re-shaping the bone of your big toe joint. The animation below shows what happens. Ask your surgeon which type of operation is best for you. You’ll need to rest until the effects of the general anaesthetic have passed. You may need to take some pain relief tablets to help with any discomfort as the anaesthetic wears off. Your foot will usually be in a bandage after the operation and you may have a splint or plaster cast. This is to protect your foot and help keep it in the right position. Your hospital will usually give you some crutches and a special shoe to wear. A physiotherapist may visit you after your operation to give you some advice about how to move around without hurting yourself. They can also teach you how to use crutches. Your physiotherapist might arrange a further appointment if you need more help. You’ll usually be able to go home when you feel ready. This will usually be about an hour or two after your operation. Your nurse may give you a date for a follow-up appointment before you leave. Ask a friend or relative to take you home, and to stay with you for a day or so while the anaesthetic wears off. Having a general anaesthetic can really take it out of you. If you’ve had one, you might find that you're not so co-ordinated or that it's difficult to think clearly. This should pass within 24 hours. In the meantime, don't drive, drink alcohol, operate machinery or sign anything important. If you need pain relief, you can take over-the-counter painkillers such as paracetamol or ibuprofen. Always read the patient information leaflet that comes with your medicine, and if you have any questions, ask your pharmacist for advice. Put your foot up in the first few weeks by resting it on a stool, as this will help to reduce any swelling. The time it takes for the bones in your foot to heal will vary depending on what operation you had. You might be able to walk straight away (wearing a post-operative shoe that protects your foot) but may need crutches for the first few days. Or you might need to use crutches for weeks. You might also need to wear a brace to support your foot for about six to 12 weeks. Ask your surgeon when you can put weight on your foot. It’s really important that you don’t do this too soon as it can affect how successful your operation is. Keep the dressing and cast dry and always wear your protective shoe when you go outside. Put a plastic bag over your foot when you have a shower. When you can drive again will depend on the type of operation you have and how long your foot takes to heal. You’ll need to wait until you’re back wearing normal shoes and feel comfortable. This might take up to three months after your operation, but ask your surgeon what to expect, and follow their advice. Your surgeon will also advise you on when you can return to work; as again, this will depend on the type of operation you have. It will also depend on the stresses or pressures your feet will be under at work. On average, people take six weeks off. If your job involves a lot of standing or walking, you might need to take off longer. Side-effects are the unwanted but mostly temporary effects you might get after having the operation. Your foot, especially your toe, will feel sore and you’ll have some swelling. The pain will gradually ease but it might take six months to a year for the swelling to go down fully. What will happen if I don't have bunion surgery? What will happen if I don't have bunion surgery? Your surgeon will usually only recommend surgery if your bunion is very painful and affects your ability to walk. Your GP, podiatrist or chiropodist will usually suggest treatments that don't involve surgery first. In fact, they may only be authorised to refer you for surgery after you’ve tried them all. These include things like pads to ease the pressure on your bunion, insoles and wearing splints at night. These may help with the pain but they won't stop your bunion from getting worse over time, so you might need to have surgery. If you decide not to have an operation, the bunion might get bigger and hurt more. So, you may end up needing to have a longer and more complex operation, but ask your surgeon what the consequences are for you. Can I wear high-heeled shoes after bunion surgery? Can I wear high-heeled shoes after bunion surgery? You might be able to wear high-heeled shoes occasionally if your foot recovers well after bunion surgery. It’s not a good idea to have bunion surgery for purely cosmetic reasons to make your feet look good or so you can wear high heels. You’ll need to wear sensible, low-heeled, wide-fitting shoes for six months or more after your operation. You might even need to wear these for the rest of your life. If you wear tight or ill-fitting shoes, they may increase your risk of getting a bunion again in the future. High heels put more weight onto the ball of your feet, which also puts your toes under extra pressure. It's important to wear comfortable shoes and ask your chiropodist or podiatrist for advice about good foot care. Wider, deeper shoes are better for your feet, as are shoes with an adjustable strap or lace. Choose shoes that have at least a centimetre between the end of your longest toe and the end of your shoe. Your chiropodist or podiatrist may suggest you wear insoles inside your shoes too. How long will it take until I can walk? How long will it take until I can walk? It usually takes at least six to 12 weeks to recover from bunion surgery, but this depends on the type of operation you have. You may be able to walk on your foot immediately but it depends on the type of operation you have. You’ll probably need to keep your weight off the affected foot for a time but you can use crutches to get around. You might need to use crutches for just a few days but it could be weeks, depending on which operation you have. And you might need to wear a plaster cast or a protective shoe after some types of operation. It can take three months until you can walk well enough to get back to your usual activities and play sport. But remember that recovery times are different for everyone. One person may feel no pain and recover very quickly, whereas another may be in discomfort and take a long time to heal. There’s no right or wrong – don’t rush to do too much before you’re ready. When you return to work will depend on the type of operation you had and how much time you spend on your feet at work. On average, people take six weeks off but ask your surgeon when you can go back. Over-the-counter painkillers are painkillers that you can buy from a pharmacy or shop, without needing a prescription from your GP. A bunion is a painful lump that can develop on the side of your foot and affect how you walk.